Everyone loves a parade…except a mascot! 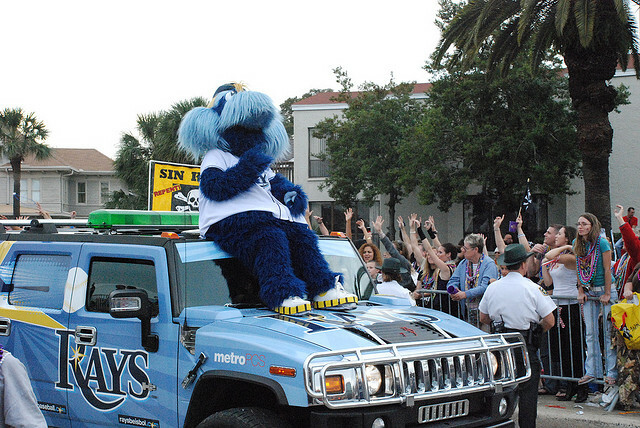 Parades are one of, if not the most grueling appearances for a mascot to perform at. Often times an inexperienced person is thrown into the costume. This can be extremely dangerous with heat exhaustion and stroke as a very real concern. Heat exhaustion is strongly related to the heat index, which is a measurement of how hot you feel when the effects of relative humidity and air temperature are combined. A relative humidity of 60% or more hampers sweat evaporation, which hinders your body’s ability to cool itself. If you, or anyone else, has symptoms of heat exhaustion, it’s essential to immediately get out of the heat and rest, preferably in an air-conditioned room. If you can’t get inside, try to find the nearest cool and shady place. Now that we’ve thoroughly scared you about heat exhaustion and stroke, let’s discuss practical ways to to have a successful parade performance. Parades are often busy and crowded events. Parking may be far away from your float, or not even available. See if you can meet up at an off site location and car pool with other attendees, or even arrive with the float. You will arrive super early, but will avoid the hassle of parking. Parades normally do not end where they started. Arrange for a ride back to your vehicle once the parade has concluded. 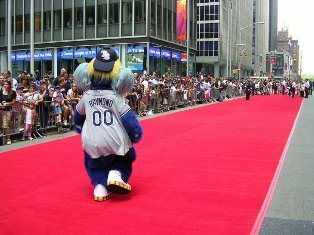 By taking care of this before the parade starts you avoid being a hot and tired mascot performer who now has to walk all the way back to their car. This will help you plot out your parade performance and how to get back to your car. This will help you locate your float faster and save you time. This also helps you estimate when your float will start moving in relation to the start time of the parade. For example, float #4 will be moving a lot sooner than float #50 which will help you determine exactly when you need to be fully dressed. Just like the float number, this info helps you know when you REALLY need to be ready. Don’t waste energy by being fully dressed 30 minutes before a parade’s start time. If you’re float #50 you could be dressed, sweating, doing nothing for a full hour before you even get to the start of the parade route. 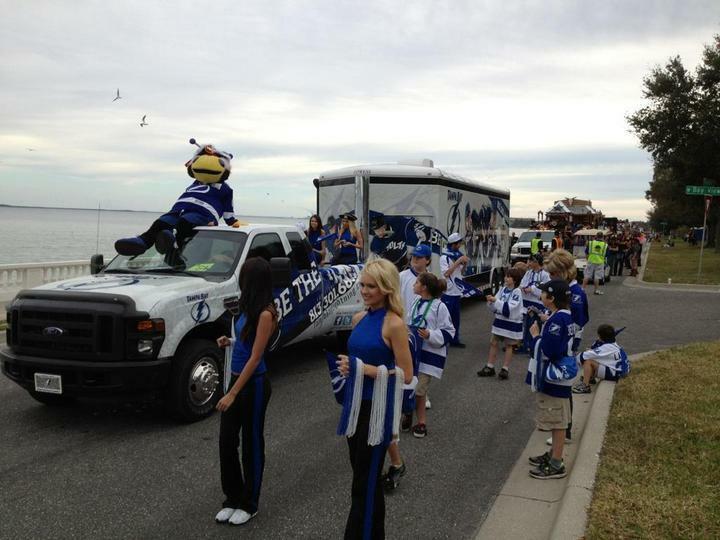 In an ideal situation your mascot either has its own van that serves as its parade transportation/float. Most mascots not working for a professional team will likely find themselves with nowhere to change. Often times you will have no choice but to throw the costume on in full view of everyone. Getting dressed in front of people violates the “mascot code” of breaking the reality of the character. but it’s up to you. If I am performing as a known sports mascot, I will not toss on the suit in front of people. If I’m a corporate character or object mascot, I have no qualms about throwing on the suit where people can see. If possible, see if another float/vehicle with space will allow you to use their space to change. If you use an off site location you will end up getting dressed long before the parade starts. If you find yourself having to get super early, go to the float and just sit down/relax. Don’t feel self conscious about not being animated. Think of the staging area of the parade as being backstage. Backstage is a break area, and you should not expect to be performing at that time. Save it for the parade route. Talk to your float organizer before the parade to see what the expectations are. For most parades it is not realistic to expect a mascot to walk the entire route. If you have a float, plan to spend the majority of your time riding on it. See if there are any rules/regulations about getting on/off the float while the parade is going on. It’s best to use common sense and only get on/off the float while it is not moving. I used to position myself on the top of the vehicle pulling the float. That way I was the first thing the crowd saw from our float. You need to check with the float organizer to see if this is OK. You also need to communicate with the driver of the vehicle so they know your intentions. Again only get on/off the vehicle when it is not moving. 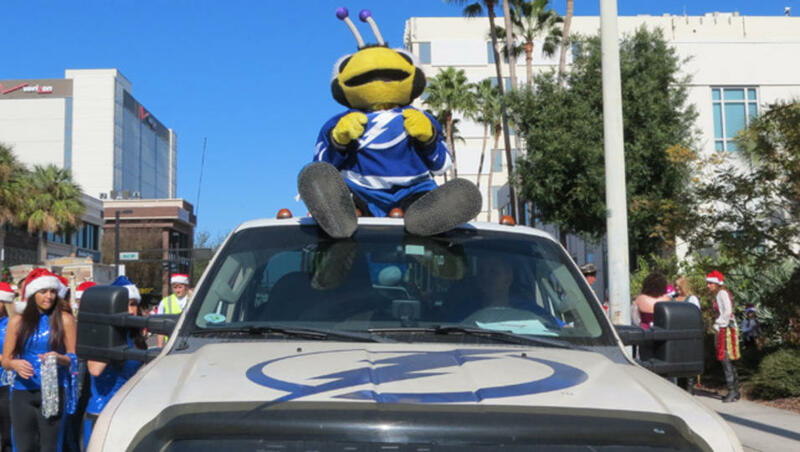 Also BE VERY AWARE of the vehicle during the parade. The driver has a lot of things to look at and worry about. If you are moving around during the parade route it is YOUR RESPONSIBILITY to not get run over. Stay alert! Some mascots like to bring their own transportation such as scooters or roller blades. Unless it’s an electric/gas scooter chances are the action needed to keep the scooter moving is going to expend more effort than expected. Iam also not a fan of roller blades. Parade routes are often uneven. You may have to rollerblade over bricks, cobblestone, or train tracks. Also roller blades prevent you from being able to jump on the float or vehicle in case you need a break. Unless you are an extremely proficient on roller blades and are in good enough shape to be able to last the entire parade on them, I say leave them at home. A parade is a marathon, not a sprint. 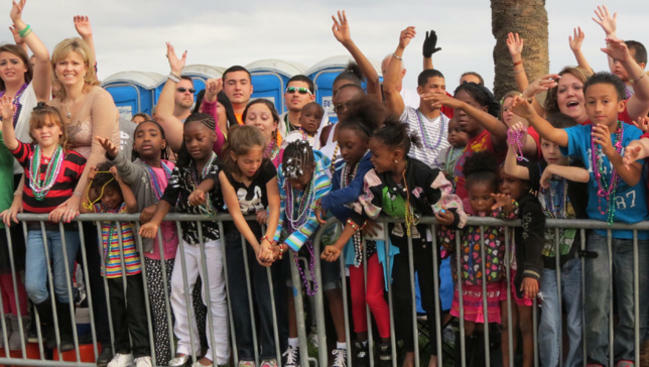 At the beginning of the parade you’ll have a ton of energy and will be very excited. This won’t last! Try to remember that an pace your energy and actions. You may start off walking the parade, then hop on the float for a little break. Then perhaps you’ll run around and dance for a bit, and then jump on a golf cart for a few minutes to catch your breath. You will not be able to be at a full 10 energy level the entire parade. Start off at a 5, work up to a 10, drop down to a 1 to catch your breath, and then move your energy level gradually back up. Ask about the judges table. This is where you want to save your best moves for. It’s a great place to launch a confetti cannon (check with parade regulations about confetti), to do your big dance move, or give away your promo items. If it’s a big parade, there may even be cameras, and they’ll usually be near the judges table. This is your time to show off! Make sure you have some gas still in the tank to do so. Pacing yourself also includes promotional items such as beads and candy. Often times floats toss out the items without considering the entire parade route, and run out half way through. Budget your promo item distribution so the kids towards the end of the parade get candy as well! You should prepare yourself for the parade before it even starts. Avoid alcohol the night before and caffeine the morning off. Both of these things will dehydrate you. Drink plenty of water beforehand, starting the night before so your body is properly hydrated. Also drink plenty of beforehand, but with enough time for your body to be hydrated and so you can get rid of any excess water. You won’t be able to go to the bathroom in the middle of the parade route, so be sure to hit the port o potties before the start of the parade. You can also take an electrolyte pill before the parade. These pills are available at Wal-Mart , CVS, and Walgreens. I do not have a recommended brand, use whatever is available. These pills help you get minerals that help you avoid cramps and dehydration without the excess water that may just pass through you. It’s important to also hydrate during the parade. If your costume’s mouth lines up with your own, you may be able to drink directly through your costume. If not consider getting a Hydration backpack that you wear under your costume. You can use water or a mix of water and a sports drink (diluted, most sports drinks have way too much sugar). To help it stay cool fill your hydration bladder up 25-50% full and freeze it the night before. It will melt during the parade giving you additional liquid an keeping everything cool. It’s also important to hydrate after the parade as well. Drink water, take another electrolyte pill, or drink a Pedialytle. I hope this plethora of information helps you have a fun, and more importantly, safe parade! Posted on July 3, 2015, in how to be a mascot. Bookmark the permalink. Leave a comment.